I'm not gonna lie. Three kids is more work than two. Two kids is more work than one. And one kid is definitely more work than none. The laundry and the crying seem to multiply with each one added. The times when you only have one or two kids to deal with feel like a break. There are just so many people constantly demanding your time and energy and attention. Nevertheless, after Nadia was born I just kept thinking, “I'm so glad she's not the first. This is so much easier.” Different people vary in their opinions of which transition is the hardest, probably depending on their particular children and circumstances at the time. For me, the first was definitely the hardest. Nobody can really prepare you for what that transition will be like. Suddenly your moments are not your own. Your sleeping and waking and eating are dictated by another person. Such a small person who causes such big upheaval. It's hard because the demands are so constant. Day and night, you never really get to clock out. It took a long time before I felt like there even was day and night as I had understood it before. You never before realized how much babies just want to be held. Like all the hours after 5pm. There are a lot of times when your options are hold (or wear) baby, or listen to baby cry inconsolably, which isn't so good for baby or the neighbors or mama's sanity. Any moments away from baby are planned around how long she will last until needing to nurse again. And oh my goodness, the sleep! Never before had my life and thoughts so revolved around sleep, and I was getting so little of it. I spent frustrating hours every day trying to get Juliana to sleep. I would go to sleep at night stressed, thinking, “If I go to sleep quickly, maybe I can get in 2 hours before she wakes up!” I never knew if she would sleep for 3 hours or be awake in 10 minutes. Now Juliana was certainly a special child when it came to sleep. I don't know hardly any babies who slept quite as badly as she did. But even with a “normal” baby, sleep is highly disrupted, likely for many months. Just when you think you've really hit a groove, there's a growth spurt or sleep regression or dropping a nap or teething or sickness or just your typical Tuesday and suddenly everything is up in the air again. Actually, I'm certain babies have legitimate reasons for the contentment and the fussiness, just like some days we feel so much better than other days. But you can drive yourself crazy trying to figure out the reason. (When in doubt, blame teething. It lasts foooorever.) I spent a lot of energy and frustration trying to figure out why Juliana wouldn't sleep. I read so much about baby sleep and tried so many things and felt more and more frustrated. I was certain that if I found just the right combination she would sleep like all the other babies. It did eventually happen, although technically by that point she wasn't a baby anymore. I wish I had stopped trying to figure it out. I still would have tried different things because we really needed more sleep, but I wouldn't have agonized over it. I wouldn't have blamed myself for her bad sleeping. I would have realized there is no One True Way. I still would have been exhausted, but I wouldn't have been so frustrated and so hard on myself. You know what, I did things pretty much the same way the second time with vastly different results. Some kids sleep better than others. It's hard because of all the comparison. Why does someone else's baby sleep so much better than yours? Why do they sit so contentedly in their little seat for longer than 3 minutes? Why do they cry less? Because they are a different baby. Maybe they have an “easy” baby and yours is more “high needs.” Maybe they are doing things differently from you, and maybe some of those things help, but babies are just different. And some of those high needs babies turn into really driven, talented people who are going to change the world. The bottom line is parenting is hard just because it's hard. It's not that you're doing it wrong – that's just the way it is. It's hard with the first and the second and the third. In some ways, it only gets harder. But it also gets easier because you expect it to be hard. You know every baby is different. You learn to laugh at those ridiculous Expert ideas that will never work in real life. You become your own kind of expert while also admitting you really have no idea what you are doing. You realize it goes by so quickly. So you take a deep breath and maybe count to ten, and then you jump back in. When I told our ayi I was pregnant, her first question was, "Do you want it?" I said I did, then I told her it was a girl. "Do you want it?" She asked again. When I assured her we did, she looked happy. At one time I would have been offended by such a line of questioning, but now I realize it was just the culturally logical inquiry. 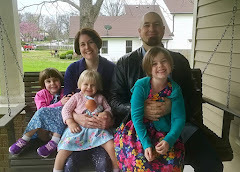 Wanting three children and wanting three GIRLS was pretty far outside the norm. Besides, she seemed relieved to find out I did indeed want this one. I love having three girls in China. I like being able to tell neighbors and strangers that no, this one is also a girl (since it is polite to assume the baby is a boy), and finding out what their response will be. Most of them are reassuring. "Girls are good." it's kind of them to be reassuring and sad that they feel like they must be. The other day when a granny heard about all my girls she looked happy. "That's how it is in my family. There are two girls." I could tell her I thought that was very good, and I think she believed me. Some are disbelieving, wanting to know the American attitude toward girls. I tell them we really do think that girls and boys are the same and both are good. Of course, in America we still believe that everyone is looking for the perfect boy-girl family. I don't know a single family with all girls who hasn't gotten comments to the effect that surely they must want a boy, and the same is true for all boy families. For some reason we have the idea that we couldn't possibly be content with just one gender. Personally I'm very happy to have all girls. I was hoping for a girl at some point, but after that I really didn't have a strong desire one way or the other, and neither did Kevin. By this pregnancy, I was rather hoping for another girl. We already have all the clothes, sharing a room won't be an issue, and we'll already be dealing with all the preteen mean girl drama anyway. While I was pregnant, our ayi asked how my parents and in laws felt about all girls. "They are happy," I said. "It doesn't matter to them. They are also happy with girls." "Oh, that's very good," She said. "In China, your in laws probably wouldn't speak to you any more if you only had girls." Attitudes are changing in China, especially in the cities. Even so, it was only a few years ago that our (mostly rural) female students were telling stories of being unwanted, or even of their families trying to get rid of them. And even so, everyone wishes you will have a boy. But hopefully we will continue to see more value placed on daughters, one (or three!) girl at a time.